Bok Tower Gardens is a non-profit organization sustained by the generosity of members and friends. 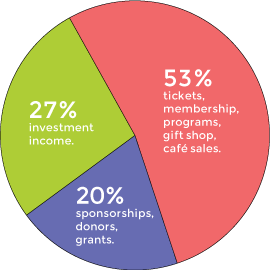 Tickets, memberships, program fees, gift sales and food sales only cover 53% of the Gardens’ annual operating budget. We depend heavily on our endowment, grants, sponsorships and individual donors to help make up the remaining 47% needed in unrestricted income. Thank you for making a donation to Bok Tower Gardens. Gifts made to our Greatest Needs fund support critical programming needs of the Gardens. Bok Tower Gardens is a 501(c)(3) organization and gifts are deductible to the fullest extent of the law. You will receive a receipt to keep for tax purposes.